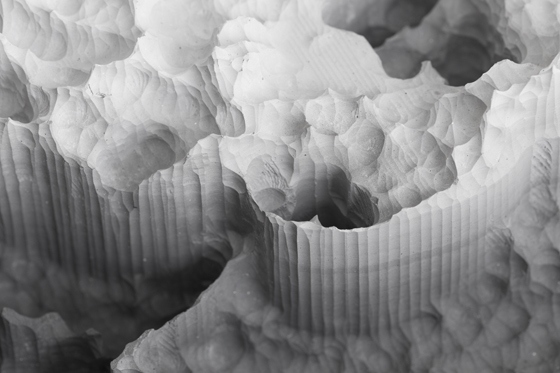 Terra Forming: Engineering the Sublime has been conceived by Adam Lowe and Jerry Brotton. 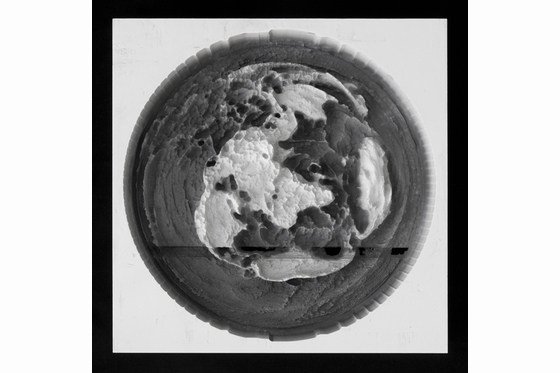 This project aims to change the way we think about the globe as a subject and an object, especially through the various cartographic projections we use to imagine it. 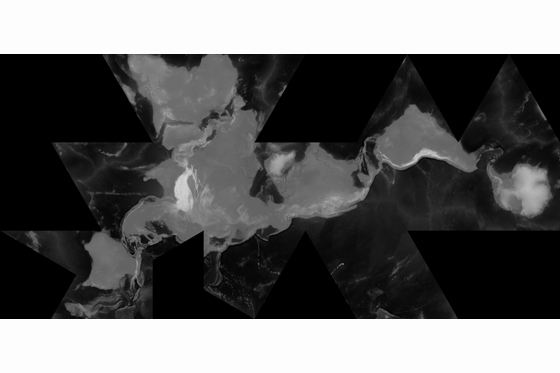 A new projection has been generated that focusses attention on the dynamic relationship between the land and the sea and Factum Arte has made a cluster of five projections of the three-dimensional surface of the world without water. Each projection is based on high-resolution topographic and bathymetric data that is available in the public domain. These projections are a way of engaging with the Earth from different points of view, and reflect historical ways of mapping the world from the Greeks to Google Earth. 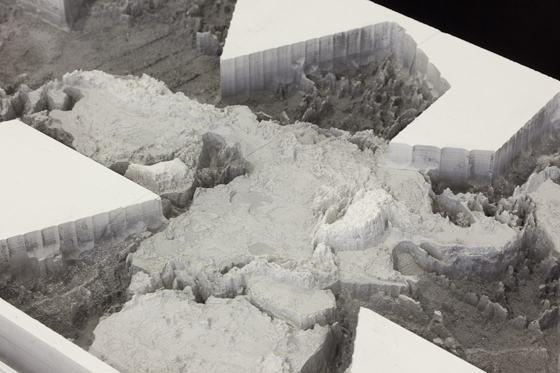 The data was prepared and routed in three dimensions into tonally gradated blocks of plaster each approximately 50 x 100 cm. The highest points are white, the lowest one black; in-between are a wide range of tones of grey. The Z axis (vertical dimension) has been exaggerated by 100 times in order to reveal an unfamiliar spiky terrain. 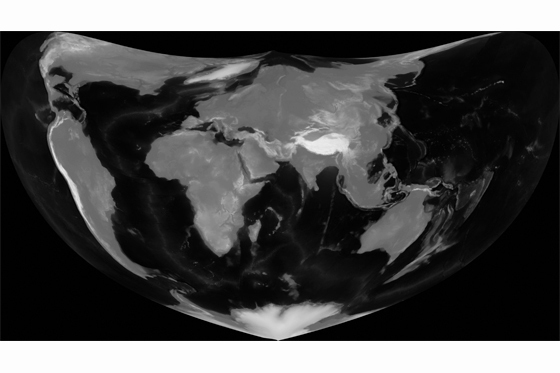 This Z axis distortion was used because without it the globe’s surface would appear almost totally flat. The installation will mimic the passage of time as well as space by flooding the world with water over several days, until we reach current sea levels; the world will then be flooded completely, leaving us with a drowned world, a prescient image for those parts of the world facing rising sea levels, as well as those such as parts of the Arabian Peninsula which is trying to reclaim land from the sea. Each projection shows how, over time, the choices of particular worldviews were defined by specific social, cultural, political and ideological interests and beliefs. The ‘terra-centric' projection is of its time with the Arabian Gulf near the centre as it was on maps from the Middle Ages. The North Pole is no longer stretched to infinity at the top not is Antarctica distorted at the bottom. The tradition of placing north at the top is a fairly recent invention: in many examples of early Arabic cartography south is at the top, in early Christian maps east is at the top. West is rarely at the top of the map because of its association with the setting sun and the onset of darkness—and death. These projections will form part of an exhibition curated by Adam Lowe and Jerry Brotton. 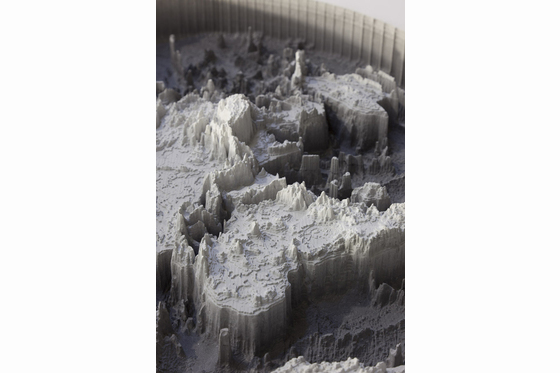 Terra Forming: Engineering the Sublime presents a journey through time and space to see how our world has been imagined and built by artists and scientists, saints and cartographers. 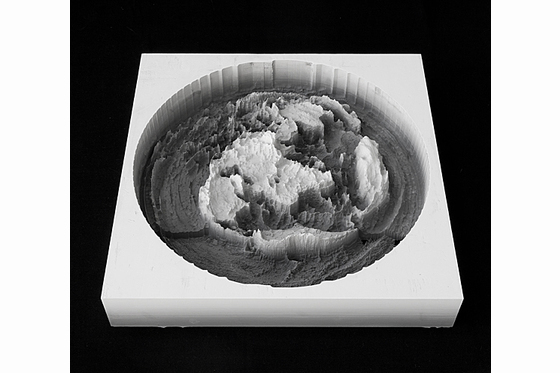 Terra-Forming will provide a creative response to the problem that has bedeviled creative minds for centuries: when faced with the staggering size and scale of the earth, how do we present a comprehensive view of the world without distorting it? This model evokes the medieval mappa-mundi dated c.1300 and which still hangs in Hereford Cathedral. It shows Jerusalem at the centre, the east at the top, and the Day of Judgment taking place beyond earthly time and space outside the map’s frame. During the routing of this object, the CNC device lost its bearings and cut through the bed of the machine. Our ability to control any intervention always has to take into account the tolerance in the system, system malfunction, unforeseen consequences and unpredictable events. Waldseemüller used elements of it on his 1507 map, the first to name America as a separate continent. Here north is at the top, the most familiar projection for those living in the early twenty-first century. It presents a view that is familiar and one many people accept as being true. A projection of the world onto an icosahedron, conceived by Buckminster Fuller in 1943. Fuller regarded this so-called ‘interrupted’ projection as far more accurate than any rectangular projection. It was also designed to show a ‘connected’ world which flowed from one continent into another. It was patented in 1946. In this model north is no longer at the top. 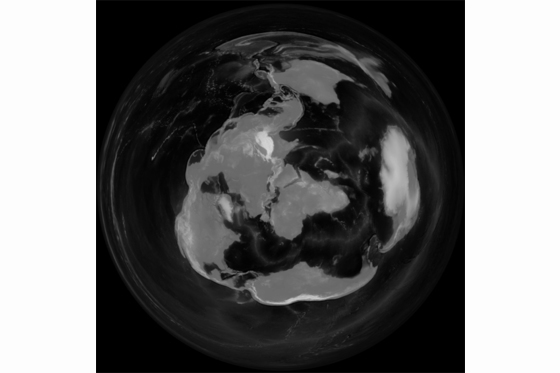 The globe was rotated before being projected onto a rectangle so that areas of water are stretched to infinity at top and bottom rather than along the two polar ice-caps. A few islands are sacrificed and are now unrecognisable. Starting with the familiar equi-rectangular projection with north at the top the projection is rotated until only areas of water are stretched to infinity at the top and the bottom. The result, while initially unfamiliar, is more of an ‘equal area’ projection and makes sense of the relationship between USA, Canada, Russia and Europe. 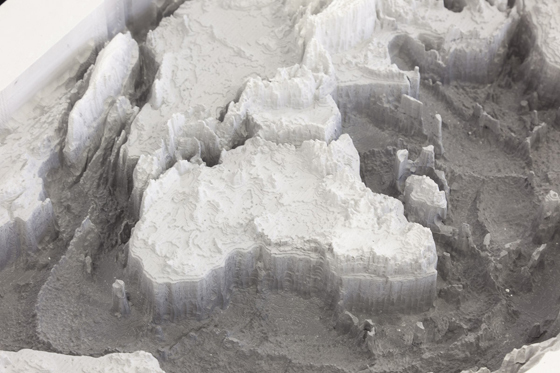 It also draws attention to the relationship between the Antarctic and Australian continents. 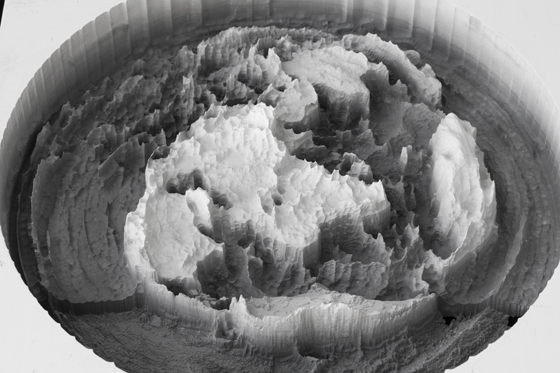 An animation of the topographic and Bathymetric data of the surface of the Earth with the Z axis (height) exaggerated by 100 times. The presence of a directional light source creating a sense of day and night as the sphere spins. 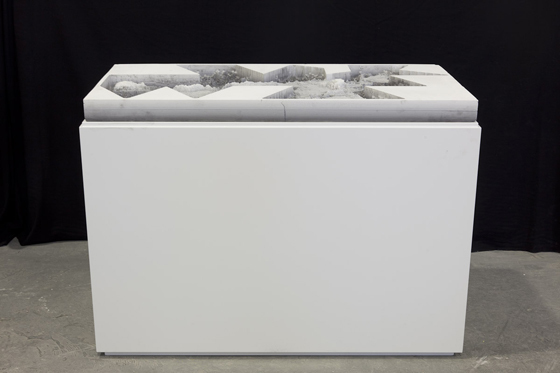 The terra-centric equi-rectangular projection developed by Adam Lowe and Gregoire Dupond has been routed into a block of polyurethane of 2x4 meters. This was been put into a glass tank with an aquarium pump and a reservoir of water. The bathymetric and topographic relief data can be slowly flooded until the top of Mt. Everest is disappears and the entire planet is drowned. The flat reflective water can be used as a surface onto which dynamic maps of temperature, gulf streams, radioactivity, salinity, political boundaries, light pollution, and other phenomena will be projected. The model makes the data more coherent, and vice versa. It can then be drained and the cycle repeated. This poetic act forces us to think about geological time and the changing relationship that has always existed between the land and the sea. 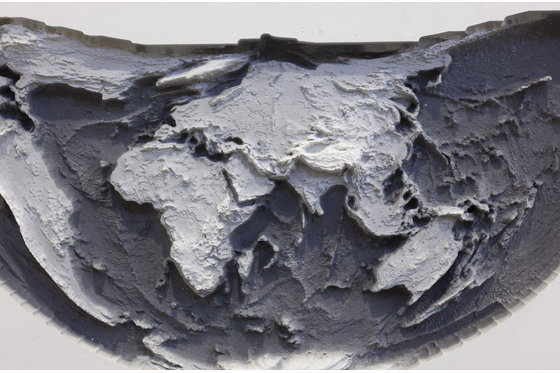 It is hoped that this model of the surface of our globe without water will find many applications and provoke a range of conversations about the dynamic nature of the world be inhabit. A cartographic response to the advent of the Anthropocene. Lowe and Brotton propose a cluster of projections as a way of engaging with the earth from different points of view. Each projection shows how, over time, the choices of particular worldviews are defined by specific social, cultural, political and ideological interests and beliefs. 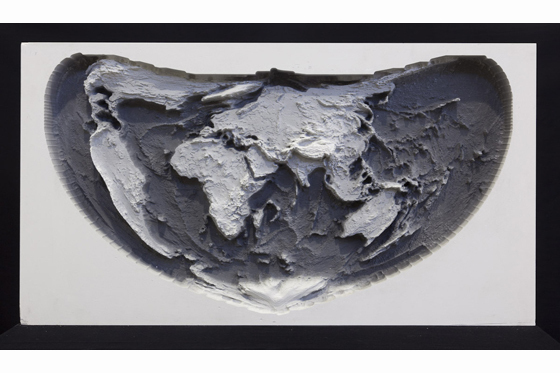 Lowe and Brotton propose a hydrophilic/hydrophobic world map, manufactured in three dimensions. 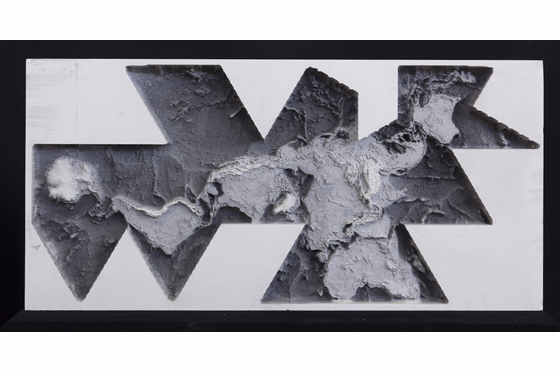 Their chosen model is a land-centred (or ‘terra-centric’) projection with a deliberately exaggerated vertical axis that dramatises the rhythms of the deluge and the uncanny features of an unrecognisably waterless world. Within this theatre of the world they stage a series of poetic acts. It explicitly draws on Renaissance and Baroque cartographic precedents, at a moment when a globalised world came into focus, and also acknowledges a series of epic nineteenth-century schemes that proposed visionary assemblages of universal knowledge and data. The first map of the lithosphere. Mapping the surface of the terraqueous planet requires a combination of topographic and bathymetric data and involves myriad decisions on the part of the cartographer. The data used here is of the highest resolution currently available in the public domain. Decisions as to how to use such data in making the world’s image have always concerned form and content, science and aesthetics. Aesthetically the issues relate to framing and shape, tone and depth, simplification and complexity, routing tolerances and time limitations, all of which introduce levels of abstractions within an essentially realistic representation. In the case of this project, discussions about content revolved around issues such as: ‘Does ice belong to the hydrosphere or the lithosphere?’ It was decided to keep the polar icecaps as they have a great contemporary significance for territorial disputes focused on the Arctic and Antarctic, and understanding the dynamic nature of mankind’s changing relationship with water. As we enter the Anthropocene epoch these relationships and their constantly changing parameters should be reason enough to pause and reflect before we take the route of geoengineering. The relationships between the lithosphere, biosphere, atmosphere, stratosphere and many other spheres are delicate, dynamic, interrelated and currently beyond the understanding of the ethnosphere. In 1930’s during a Surrealist demonstration against classical culture, Joan Miró carried a banner declaiming ‘Down with the Mediterranean!’ This seemingly innocent statement shocked even his fellow Surrealists who were more intent on attacking the church and other powerful institutions. But Miró’s statement showed that the world we inhabit is also a concept. Perhaps one of the most radical representational acts is to change the projection we are familiar with to force an engagement with an unfamiliar world. All projections force us to examine our prejudices and assumptions. Why is north at the top? Why not south as in classical Islamic maps, or east as is the case of medieval Christian mappa-mundi? Why follow Mercator and allow the north and the south to be stretched to infinity at the top and bottom? How do we map things that move like icebergs and clouds? Why not use different graphic devices and layered information? 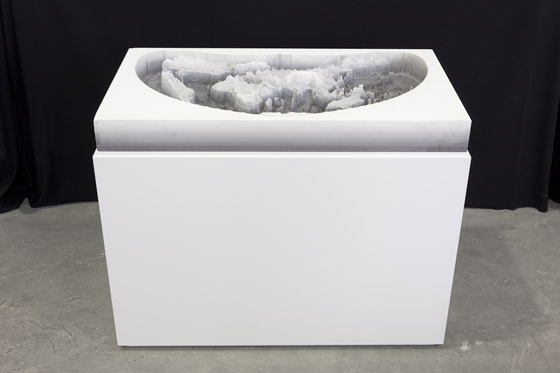 Lowe and Brotton use today’s digital tools to produce a world without water, manufactured in three dimensions with a terra-centric projection with the vertical axis exaggerated 100 times in order to throw into dramatic relief the variegated surface of the planet. Without such deliberate distortion, when represented at this scale the surface would be as smooth as a billiard ball. The different projections have been prepared by Grégoire Dupond and Francesco Cigognetti from freely available online data. The models are intended to be made on a vast scale to create a dialogue with other great cartographic projects. These range from Martin Behaim’s earliest surviving terrestrial globe (Erdapfel) made in 1492; Vincenzo Coronelli’s baroque globes (1680-1690) measuring nearly four metres in diameter; James Wyld’s monumental cast-iron globe built in 1851 and put on display in Leicester Square for the audience to walk in and around its cavernous 18.9 meter diameter; and Elisée Reclus’ proposal for a 160-meter globe containing a second revolving globe for the World Expo of 1900. Reclus’ utopian project was never made, but it continues to influence generations of thinkers. *The title Terra-forming: Engineering the Sublime is intentionally active. It does not propose to just re-present our environment: rather, it insists on engaging with the processes through which it is performed and made. The world is after all both a subject and an object, though one that we can never fully know in our endless act of mapping its contours. The philosophical concept of the ‘sublime’ was popularised in the eighteenth century to make sense of overwhelming things beyond our comprehension. In writings on the sublime vast objects and natural phenomena are particularly favoured subjects: not just floods, storms, eruptions, chasms and modern cities, but also over-population, global warming and climate change. These things can freeze us with fear, or they can be a prompt to action. The decision to take charge and act is constantly frustrated because of a massive failure of vision, of aesthetics, which this display hopes to play some part in highlighting, and perhaps even changing.